Poor Riri! Rihanna may not be very "Loud" during her highly anticipated performance at Sunday's Grammy Awards, as she's battling combination of bronchitis and laryngitis. 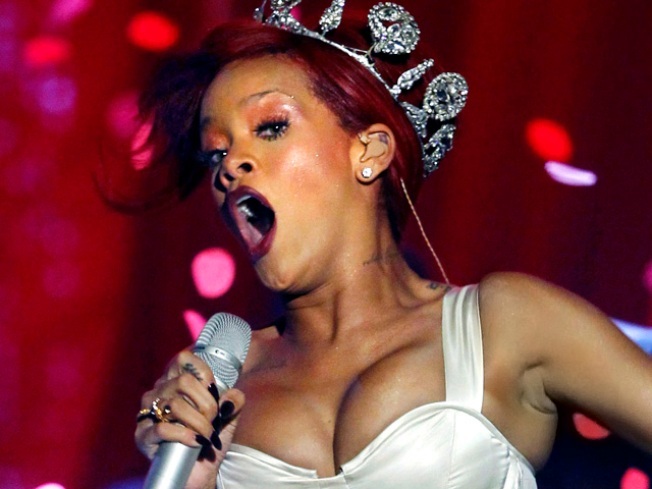 The Barbados-born singer Tweeted a friend on Thursday saying, "Bronchitis and laryngitis boo! I'm still goin to rehearsals tho! Sunday is everything." The 22-year-old superstar is set to take the stage for music's biggest night with Drake and is reportedly seeking medical help in preparation for the show, according to RadarOnline. "Rihanna is on steroids and antibiotics to get her as prime time ready as possible for Sunday night," a source reportedly told the site. "[She is] scheduled to rehearse again on Saturday at Staples. "But she probably won't be using her voice a lot at that time," the source reportedly added. "She is saving it for Sunday night." The "Only Girl In The World" singer is definitely feeling the pressure to find a remedy as quickly as possible. "I CAN'T STOP thinking about tomorrow!! !," she Tweeted on Saturday morning. "#AnxietyF--k!!!!!!!" VIEW THE PHOTOS: Grammy Awards 2010: Inside The Show! As previously reported on AccessHollywood.com, Rihanna is one of the performers scheduled to take the stage along with Lady Gaga, Arcade Fire, Cee Lo Green, Katy Perry and country star Miranda Lambert. The 53rd Annual Grammy Awards will air live on February 13 at 8 PM on CBS from the Staples Center in Los Angeles.